The new trend in heavy bags and punching bags is now the apparition of water heavy bags or aqua punching bags. They have many advantages such as creating a more realistic feel as well as allowing to hit harder with a reduced risk of injury. 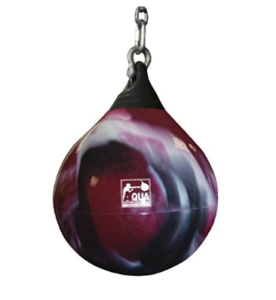 More and more brands now offer customers a few aqua punching bags in their range. We thought it is worth looking at this in a little more details to help you in your questions: What is an aqua punching bag? what are the benefits of an water heavy bag? What is the best water punching bag? Water being more flexible allow for a better landing of your punches. This will allow you to punch harder and have a better feedback from the punching bag. The water bounces better than most hard of soft fill materials. Also the human body is itself made of 65% of water an aqua punching bag will replicate this better than sand for example. This is perfect for all MMA, Kick Boxing, Muay Thai boxing who will appreciate the more realistic training conditions. Water filled heavy bags do swing a lot less than other filled heavy and punching bags. Thanks to the physics attributes of water the bag will hardly swim even after powerful punches and kicks. Perfect for strong athletes! With a hard heavy bag when your punch is too powerful or at an off angle it can result in an injury on your arms, hands, and knuckles and then put you off training for several precious weeks. Often under estimated injuries are one of the main reason for many fighters to not reach their maximum potential. Choose a water punching bag and optimise your training time. Multifunction – It can be used inside or outside as well as in your private gym or in a professional Gym thanks to great durability. One of the main advantage of the aqua training bag is the huge difference in weight and volume when filled or unfilled. The 18 inch will weight 120 pounds filled but only 12 pounds when not whereas the 21 inch heavy bag will weight around 190 pound when filled but only 15 when in the parcel ready to be shipped. A great advantage if you want to move around with your punching bag. The Aqua Training Bag has a unique design using a shell and water filling that will give you a feeling close to hitting a real opponent ( in a ring of course ). The strength you put in your punches does not have to be controlled as much as with a conventional bag thanks to the great absorption of the internal water housing. Long Lasting – The Aqua Training Bag is designed to last and is guaranteed for 2 years. It will feel the same years from now as the first day you hit it, no settling or hard spots even after years of use. What is in the Aqua training bag box? Obviously the heavy bag itself. When opening the box you can be ready to punch in a few minutes. Just make sure to first attach the heavy bag to a strong support that can hold the maximum filled weight and then start filling with water thanks to the hose filling nozzle.